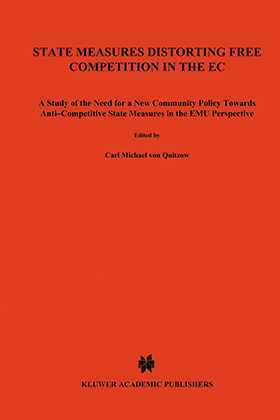 This study deals with issues of particular importance in the EMU perspective. State measures may occur in the sense that they exclude market access for opt-out state economic operators and preventing them from competing with domestic economic operators, i.e. restrictions on free movement. After the removal of such barriers there might still be state measures that may negatively affect competition within the common market. Such distortions of competition may occur due to differences between national legislation or other forms of state intervention on the market. They affect the prerequisites for the carrying out of economic activities, and may often result in the fact that out-of-state economic operators have to work in a market where a domestic competitor has notable advantages due to support by authorities, legislation or economic support. This may threaten the efficiency and proper functioning of the EMU. The remaining question is how such distortions can be dealt with. Which distortions are to be regarded as serious threats against the market integration and must be removed? Which priorities have to be made? The study aims at giving possible solutions to the above-mentioned issues, thus contributing to a field which as yet has only been examined by legal scholars to a minor extent.